Life's Little Stars: Love me some LUSH! Every time I go shopping, I walk past Lush and I am overcome with a smell of gorgeous bath products that seduce me into entering that heavenly shop and reduce my bank balance. If you have never heard of Lush (where have you been?) LUSH produces fresh-made soaps, shampoos, shower gels, lotions, moisturisers, scrubs, and other cosmetics for the face, hair, and body using 100% vegetarian recipes. It is affordable, long-lasting and leaves you feeling (and smelling) absolutely glorious! Candy Fluff Dusting Powder: Candy fluff is my favourite dusting powder because it smells beautiful and it is so versatile. I usually use it as body powder but it is also great for using as dry shampoo. I often find that some dry shampoos leave your hair smelling of artificial chemicals but with this product you smell like candy floss all day long. I brought this about a year ago and, even though I use it frequently, I still have half the tub left. An extra bonus with this product is that there is glitter infused in it! I always get compliments on how nice I smell (well of course...I smell like candy floss!) when I wear this and it is one of the few powders that I have that is able to maintain the perfume all day long. 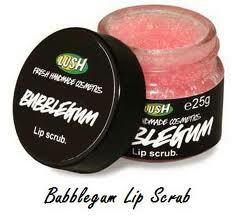 However, I have heard that this has been discontinued but if you are interested then check in your local Lush. Sweetie Pie jelly: Lush have a few shower jelly products but this has got to be my favourite. The fruity smell of the blackcurrant and cherry is mouthwatering enough to want to it (DON'T!) but I have to make do with using it in the shower. I chill this in the fridge before using it for a more soothing experience but you can also use it at room temp or frozen. This product is also versatile as it can be used as a shower gel AND a shampoo. The jelly lasts for a very long time and it makes shower's so much more fun! You are probably waiting for me to tell you not to eat this product either BUT you can! This Lip scrub is amazing because it works wonders at making your lips soft and smooth, but it also tastes like bubblegum so once you're done scrubbing...you can start licking those lips! The pink bubble bar smells so good, I wish I brought it but I went for the candy one instead. Thanks for the Lovely Comment :) I like your blog to, I followed! 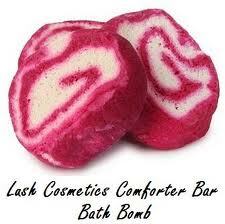 I adore Lush, I honestly cant get enough of their products. Hi, I'm following you. Loved your blog when I checked it out yesterday.